Unknown gunmen assassinated Hayat Tahrir al-Sham’s commander, Abu Omar Tafkhikh in the village of Sheikh Ali, west of Aleppo. Syrian Democratic Forces reportedly captured the village of Haddaj in southern Al-Hasahak from the Islamic State. Hayat Tahrir al-Sham conducted a raid against the Islamic State’s elements in the city of Kafr Nabl (Kafranbel). One element of the Islamic State was arrested, while another element blew himself up with an explosive belt. Unknown gunmen attempted to storm ‘Sham 4’ hospital near the city of Kafr Nabl, however, after clashing with the hospital’s guards the gunmen withdrew from the area. Reports suggest that one of the gunmen was wounded in the encounter. 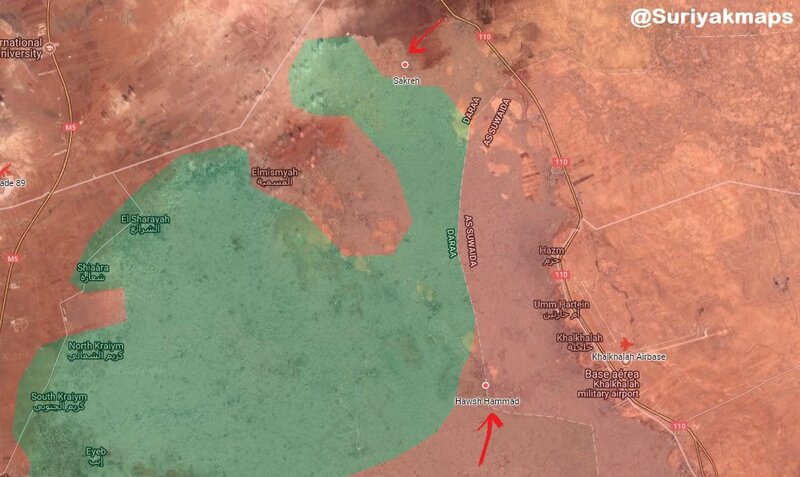 Syrian Arab Army and allies reportedly completely cleared the desertous area between T-2 airport area, Muazilah, and Al-Bukamal (Albu Kamal) from the Islamic State’s presence. Syrian Arab Army and allies reportedly captured Hawsh Hamadah, Sakreh and Jadal in Al-Lajat region from the rebel factions. Afghan National Security Forces killed six and wounded one element of the Islamic Emirate of Afghanistan (Taliban), as well as destroyed three motorcycles in Khaja Sahib Posh district. Afghan National Security Forces killed 11 and wounded ten elements of the Islamic Emirate of Afghanistan, as well as destroyed three fighting positions in Imam Sahib and Archi (Dasht-e Archi) districts. Islamic Emirate of Afghanistan killed eight and wounded 18 elements of the Afghan National Security Forces, as well as destroyed two armored vehicles in Imam Sahib district. Afghan National Security Forces conducted a special operation against the Islamic State in the village of Saferi in Chaparhar district. The security forces killed an important Islamic State’s commander, Adam Khan, who reportedly organized and participated in several of the group’s attacks in the city of Jalalabad, capital of Nangarhar Province. Afghan National Security Forces killed 25 elements of the Islamic Emirate of Afghanistan and destroyed five vehicles in Jalrez district, according to the Afghan Ministry of Defense. Afghan National Security Forces killed one and wounded three elements of the Islamic Emirate of Afghanistan, as well as seized two motorcycles in Zurmat and Jani Khel districts. Afghan National Security Forces killed five elements of the Islamic Emirate of Afghanistan in the province. Islamic Emirate of Afghanistan attacked Afghan Local Police’s positions in Bazar area of Shindand district, reportedly killing ten and wounding six elements of the local police. One element of the Islamic Emirate of Afghanistan was killed and two wounded in the encounter. Islamic Emirate of Afghanistan seized a PK machine gun, a sniper rifle, an RPG launcher, and two assault rifles from the killed elements. Afghan National Security Forces killed 32 and wounded 19 elements of the Islamic Emirate of Afghanistan in Muqur and Ghazni districts, according to the Afghan Ministry of Defense. Islamic Emirate of Afghanistan ambushed and killed two elements of the Afghan National Army in Bazar area of Deh Rawud district. Islamic Emirate of Afghanistan’s improvised explosive device killed three elements of the Afghan National Police in Tori Shah area of Sangin district. Islamic Emirate of Afghanistan overran five Afghan National Army’s checkpoints in Sar Khobaib area of Shah Wali Kot, killing two and wounding one soldier in the process.